I have never met Hasan in person, though it seemed as if the universe kept nudging me towards him. It all started with Josh Hey’s remix of Hujairi’s piece “Prelude to Orpheus #2.” After doing some research on Josh Hey and discovering he was associated with Paxico Records, I was immediately reminded of my friend and fellow Paxico Records producer, Malik Abdulrahman. I reached out to Malik, and to my utter surprise, he urged me to reach out to Hasan Hujairi. Yet again, all the signs pointed to Hujairi. Fast forward to today—I now understand why. Hujari is more than a musician—more than a researcher. To describe him with a single title would be small-minded and would fail to fully capture the true essence of who he is. Simply put, Hujairi is an experimental sound artist, oud player, writer, and ethnomusicologist. His art draws from an eclectic collection of academic and cultural muses—his compositional style is fueled by this insatiable thirst for discovery and knowledge. To find an Arab experimental artist as unique as Hujairi is not only rare but also encouraging. His virtuoso points to a shift within the music scene of Bahrain. It is no surprise that a musician like Hujairi has a Ph.D. in Music Composition from Seoul National University. He has also participated in a roster of international art residencies, for his love for musical tradition and exploration has taken him around the globe. Be that as it may, it all started with the oud: the paradigmatic instrument of the Arab World. Hujairi was in Japan studying for his MA in History/Historiography at Hitotsubashi University in Tokyo, and strangely, it was where he felt he developed the most as an oud player. In 2010, after participating in the London edition of Red Bull Music Academy and in the Celtic Connections music festival in Glasgow, Hujairi hit a wall. He described the moment as “a turning point” that helped him rethink his approach to the instrument. As can be heard on THROAT, Hujairi’s compositional process is unique. He managed to blend acoustic and electronic instruments in a manner so seamless that it sounds like a simple, straightforward process, which it is not. Fascinated by the DIY approach to building and hacking electronic instruments—an element he now uses in performances—Hujairi began exploring a whole new realm of composition. He built his own light-sensitive, hybrid analog-digital synthesizer in 2012 called the Oyster-Pacemaker. He also experimented with a Nintendo Wiimote controller used as a MIDI instrument. 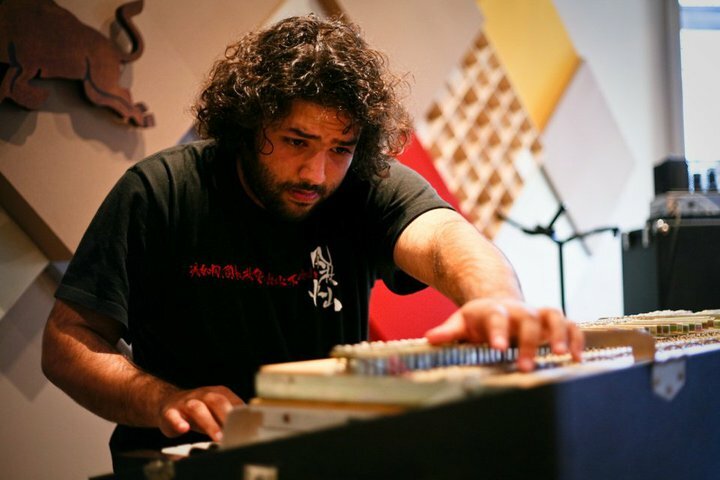 Hujairi describes that “it was mapped to hundreds of different instruments, and [he] didn’t ever fully know what sounds [he’d] get as [he] played it.” This gives Hujairi’s performances an aleatoric dimension, one that directly references John Cage’s style and influence on him as an experimental musician. When I listen to THROAT, I am immediately sucked into the depth of Hujairi’s emotive mind. Pieces like Mellifluous Hiraeth or Cities of the Future are world-building experiences; the jittering sounds of a glitching guitar sample, the meditative soft-pad, and the use of drums underneath as more of a living pulse than a rhythm, are mesmeric. THROAT paints a portrait of a perfectly imperfect world, one that only takes what it needs from reality. Hujairi’s field recordings are an integral starting point to his creative process. In THROAT, he designs a world for himself—an escape, a place for his most introspective moments. Hujairi is now back in Bahrain after completing his doctoral studies this past August. Bahrain is certainly not a melting pot for art, and establishing a career as a professional musician, let alone an experimental musician and academic, is not a simple task. Hujairi admits that he “still finds [himself] encountering this ‘dismissal’ of music careers within the Arab world, but [he’s] just stuck to [his] guns on wanting to do it.” While he has attempted on many occasions to arrange talks and workshops on noise art/experimental music in his native Bahrain, few people have attended. “I feel like I’ve still got a lot of work to do if I am to change people’s attitude towards new music. I recently started something called the New Music Ensemble of Manama, which is something I’m hoping will attract larger audiences,” Hujairi said, taking on this task as though it were his responsibility.